This post was inspired by a visit to MoonDoggie. While most kids were busy begging their folks for a dog or cat. What did I long for? A frigging hamster. Yup, a furry rodent that would feast on hardened kernels of corn or sunflower seeds and sleep amongst a pile of wood shavings. That was my dream pet. 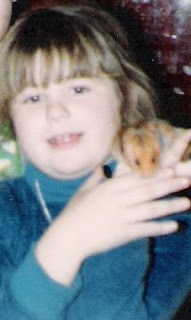 Around age 10, I remember wanting a hamster more than anything. I would draw pictures of hamsters with my Crayola Markers and come up with names for them until finally my parents gave in. They made me promise to take care of it and I did. I never once needed their help other than to help me fetch hamster food, and bedding from the pet store. My dad knew of a pet store in the Baldwin, Long Island area so one spring day the family set out to find my new furry buddy. I remember how excited I was to bring him home. He was the color of light chocolate so I named him Cocoa. I remember how his little warm body would squirm when I gently held him to my chest. His head was in constant motion, almost as if he was always on alert. His whiskers would tickle me when I gave his tiny face soft, delicate kisses. His fur smelled like the colored wood chips and shavings I'd leave in his cage. That year, my dad set up his childhood Lionel train set in our basement. Silly kid that I was, I put Cocoa in one of the open train cars and then activated the train. It worked as well as the time I tried putting my mother's cat in my doll carriage when I was five. I loved how finishing up a roll of toilet paper and placing it in his hamster cage. I would watch Cocoa attempt to squeeze through it. I could watch "Cocoa Puff"--as I sometimes called him--for hours in his little safe haven. The sound of him roaming the yellow and orange transparent tubes or burning calories on his little wheel would lull me to sleep every night. I swear, if we didn't have a cat, I think I might actually buy another hamster. Hamsters are pretty great pets. We had two for a couple of years. I had to find them other forever homes when they started chewing through their cage. We were a dog family. So no little furry friends for me. Though at one point I did manage to convince my parents to get me a gerbil, but then I realized those things are vicious. My friend had one and it bit me. Blood everywhere. So that was that. Hamsters are more docile from what I've heard. Sounds like Cocoa was a cutie. I don't think he would've bit me. I have something for you at my place. Dog, cat, bird, or hamster...it doesn't matter, because once you get attached to them, they're all the same! that was a nice story! 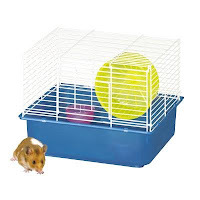 I had dogs, cats, rabbits and rats but never had a Hamster. I was more into rabbits but they always died on me. awww! I never had a hamster, gerbil or guinea pig. Now when I go to the pet store with my husband, I'm like a little kid and I want one of each! I'm glad you took care of your hamster. The Daughter has been after us to let her get one, but the answer is no, because I know she won't take care of it. Not after the dog fiasco. I always wanted a pet hamster. But you don't get them in Australia. We loved our hamsters! My brothers and I each had our own. Then they multiplied (which is what naturally happens when one is a girl and the other two are boys!) Lots and lots and lots of squirmy hairless babies! Your post makes me want to run right out and get one for my kids! I have many hamster stories! You may have inspired me to write a post about one of them. Cocoa looks like a sweetie! Awwww! Hamsters are AWESOME! Mine was named Houdini and he lived up to his title... he used to escape all the time and we would find him behind the fridge. My dad would get so irritated every time he'd have to move that darn fridge to get the hamster out! Long live cocoa! Love your Post, Ally! Brought back a flood of memories from my youth. My brother and I were lucky enough to have two hamsters. We named them "Fatty" and "Skinny" because one was fat, and the other one was... well you get the idea. Kids can be so non-creative with names sometimes. We loved them and did all the things you talked about. I'm going to write a post on my blog in the next day or two about them rather than go on and on here. Good job for sticking to your word as a kid and actually taking care of your little furry friend! Sounds like he was a great part of your young life! I am loving your Hamster and first pet stories! We should make it Hamster week in the blog world. Ha ha! Too cute! I totally want one now. Dang cat. Ha ha! I've hated hamsters ever since they made my youngest nephew cry. When he was 6 he got a hamster that unknown at the time was pregnant. He was excited about the little ones that appeared seemingly overnight. And then they went missing. He rooted through the bedding to see if they were hiding and instead found pieces of them. Apparently the mother will sometimes eat its own. I'll stick to cats, myself. That is so cute! People who have hamsters really like them. I am tempted, but find that the battery operated ones are quite entertaining too! I am done with pet poop! DONE! 2 dogs and 1 cat. Thank god, EMily hasn't asked for a hamster cause i just KNOW I would cave. I am most impressed with your choice in names for your hamster! Thanks for dropping by, Ally. I'm doing the same, with a virtual hug. I am laughing so hard I am crying at the thought of your little Cocoa's train ride. Hahahahaha! I always wanted a chinchilla but my parents were never convinced that I would take care of it. I did have a bunny once. I named him Chuck but he only lived 2 weeks?! Poor Chuck! I had a guinea pig! 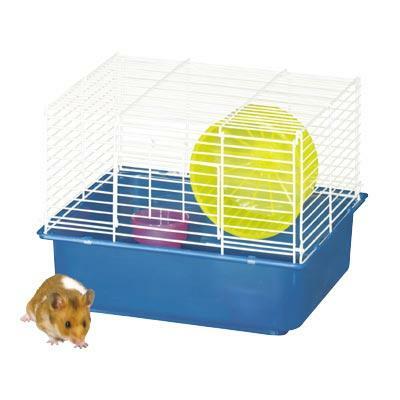 So I can completely understand what a great pet a hamster can make. I remember the wood chip smell vividly, as well as the scent of their food. Good times! Then, when Ken Griffey Jr. went to the hamster farm in the sky, my bro begged and pleaded again to get another hamster.... 'I promise I'll do better with this one! I swear!' he'd say. So, of course, my brother gets another hamster and calls it Ken Griffey Jr. Jr. and takes care of him for a week, until the hamster started biting him.... Then my parents took care of Ken Griffey Jr. Jr. until he left us. Sounds like Cocoa was a good friend! By the way, is 'pleaded' a word? Nice story, Ally! I got my first hamster in 7th grade. He was like having a tiny pooping teddy bear and was very cute and affectionate. But he was an escape artist and could often disappear for days. And when I'd find him he'd chewed up my shoes or toys. Which is probably why he was also my last hamster. That was really cute, thanks for sharing. So cool. I was this way with Gerbils! Mine was the color of Peanut Butter.. so I appropriately named her "Peanut Butter". LOL! Thanks for dredging up some good memories!! Thanks for mentioning me - glad I could inspire you to post. Wreford's doing well and I only hope I can be such a kind and loving hamster owner as you were.